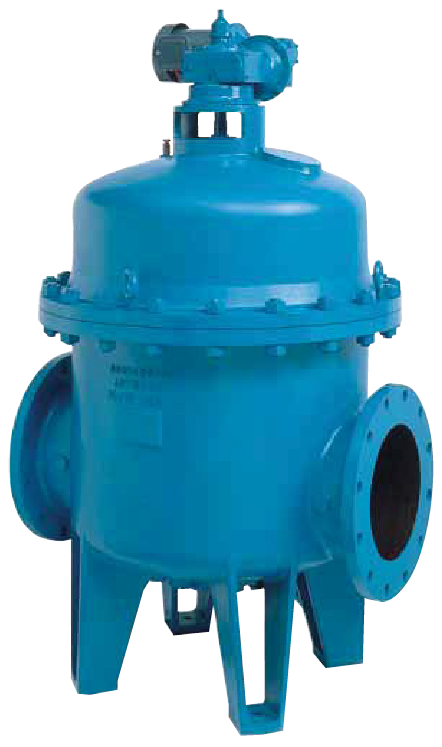 The Eaton 2596 automatic self-cleaning strainer is a motorized unit designed for the continuous removal of entrained solids from liquids in pipeline systems, preventing damage to expensive pipeline system components. It features the unique idL™ shaft seal that positively prevents leakage from the backwash shaft at the top of the strainer. With Eaton’s idL seal the exterior of the strainer stays dry and clean in service, there is never any bothersome external leakage or weeping of the process media down the sides of the strainer. Eaton’s automatic self-cleaning strainers are commonly used on water service in which the disposal of debris and backwash water is not a problem. Continuous flow is assured and protection is provided for nozzles, pumps, valves, heat exchangers, and process equipment. With an automatic control system monitoring the strainer operation, cleaning is accomplished by an integral backwash system. A small portion of the screen element is isolated and cleaned by reverse flow. The remaining screen area continues to strain – providing uninterrupted flow. With this efficient design, only a small amount of the liquid being strained is used to carry away the debris from the strainer. Eaton’s Cast Model 2596 Automatic Self-Cleaning pipeline strainers 2″ to 8″ are available in cast iron or stainless steel. The strainers are available 2”, 3”, 4”, 4”L, 6”, and 8” sizes and feature Eaton’s Cenpeller™ Technology, which consists of a unique vane plate positioned at the inlet of the strainer element where it contacts the flow before it enters the element. The vane causes the incoming flow to move in a circular motion, forcing the debris against the surface of the strainer element rather than impinging on the element and lodging in the element’s openings. Lodged debris can negatively impact the differential pressure across the strainer, resulting in a shut down of the strainer, while the element is manually cleaned. Eaton’s Cast Model 2596 Automatic Self-Cleaning pipeline strainers 10″ to 16″ are available in cast ductile iron. The strainers are available 10”, 12″, 14”, and 16” sizes. Eaton’s Cast Model 2596 Fabricated Automatic Self-Cleaning pipeline strainers 10” to 60″ are available in fabricated carbon steel and stainless steel. The strainers are available 10”, 12”, 14”, 16”, 18”, 20″, 24”, 30”, 36”, 48”, and 60″. Process Industry – Protect heat exchangers, pumps, valves, and water spray nozzles. Power Industry – Strain pump seal water and traveling screen wash water. Pulp & Paper Industry – Remove and separate bark and chips for recycling and prevent clogging of nozzles. Sewage and Water Treatment Plants – Straing secondary effluent prior to discharge and provide clean plant service water. Primary Metal Industry – Provide clean water for quenching, descaling, and blast furnace cooling. Irrigation/pump house – Protect sprinkler nozzles and improve efficiency while reducing repair and equipment replacement costs.